Ashdene Care Home has been a family business since 1994 and is owned by Michael Hunt and Joan Scott, Michael being the Company Director and responsible person. The home manager, Jilly Hunt, has been working at Ashdene Care Home for 9 years. During this time Jilly has achieved her Level 3 in Health and Social Care and her level 5 in Leadership and Management. Jilly is also a Dementia trainer and an Infection Control practitioner. Jilly has worked her way up at Ashdene having 4 roles within the company, starting with Activities Co-ordinator in 2009, Staff Supervisor in 2010, Deputy Manager in 2011 for 5 years, and Registered Manager within the last year. Rob Wing is the Deputy Manager. Rob has attained his level 3 in Health and Social Care and is currently working towards his level 5 in Leadership and Management. They are supported by 16 Senior Care Assistants, all of whom have gained NVQ level 2 or 3 and have experience in Dementia Care. There are also 34 Care Staff, 1 Activities Co-ordinator, 1 Administrator, 7 Kitchen Staff, 5 Domestic Assistants, 2 Laundry Assistants, and a Maintenance Man / Gardener. All members of the team are given regular staff supervision and appraisals, as well as appropriate training to meet the needs of our residents. We aim to have 8 Carers on duty during the day and 4 at night. 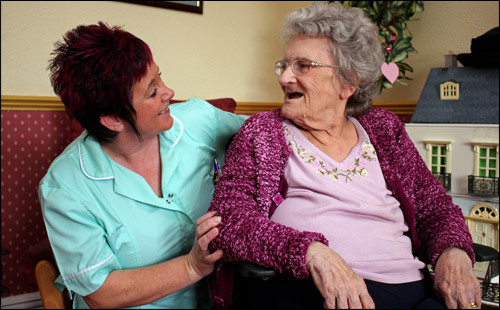 Staffing levels are determined by the needs of our residents but at all times there is a Senior Care Assistant on duty.